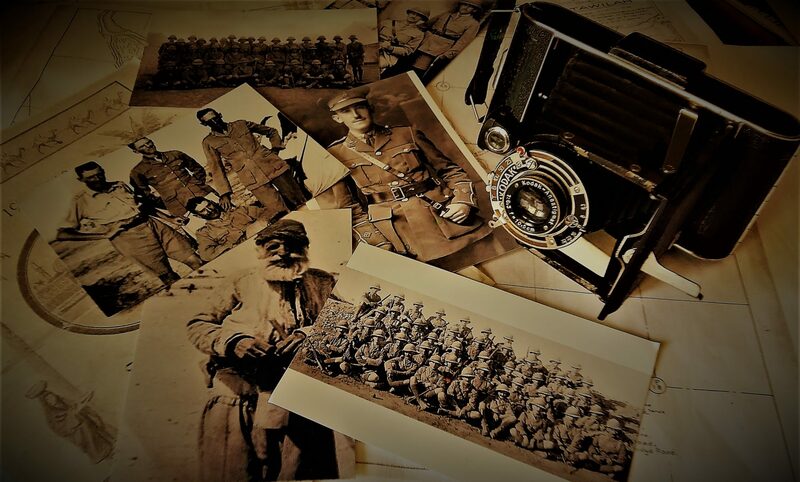 William J. Grummett’s collection of wartime photographs provides a captivating look into the the life of a soldier of the first World War. At the same time it is a record of the people and the places and the time in which he found himself. Fortunately, he wasn’t satisfied documenting things military and trained his camera on the people, the architecture and the natural beauty of the landscape. The collection contains shots that are unusual and sometimes haunting in their contemplative quality. For example, in the photo below he has captured the inside of his tent, at some camp along the Persian Front in Mesopotamia, and the absence of people yet the presence of personal articles, suggests something of the loss or separation that must continually confront the soldier engaged in warfare. As far as can be determined, the wartime photos are Will’s first foray into photography. Despite that he seems to have taken it quite seriously and so much so that he may have developed some or all of the negatives. Notations in his expense book (he carefully tracked his personal expenses and noted them throughout the war) include developing chemicals and film tanks. His commitment must have been tested by fatigue and the illness he suffered and yet there are very few gaps in the picture record. In all he took about 400 pictures. Judging by the absence of photographs of training in Canada (e.g. the camp at the Toronto Exhibition Grounds, Niagra on the Lake etc), I believe he bought the first camera upon his arrival in England in June of 1915. According to his expense tracking notebook the camera was a Vest Pocket Kodak (VPK), a small folding model that could be slipped into a shirt pocket. The VPK was the first to use no. 127 roll film and originally cost $6 when they were introduced in 1912. It is a marvel that he was able to keep the camera functioning in the trying, desert conditions in Mesopotamia. Just before and in the early days of the War, the Eastman Kodak Company was promoting the VPK as, “The Soldiers Camera” with the quite possibly dangerous encouragement for soldiers to “make your own picture record of the war” as though the war may have been some holiday outing. The naivete is startling when you consider the violence and destruction of the War. Fortunately Will seems to have avoided the dangerous and the horrific, opting for sensible safety and, it would seem, kept his duty as a soldier and an officer as his first priority. The photographic record he did manage to capture, in appropriate moments, is extensive and quite remarkable. It’s single largest drawback, however, is that only a small number of the pictures were annotated and these tend to be frustratingly cryptic as to people and place. For the most part no names, places or dates or other notes were affixed to either the slides or negatives. As a result, some of the pictures say less than they might. In an attempt to both organize and use the pictures to tell Will’s story we had notable geography, historic architecture, uniforms and an organized set of glass slides to work from. After the war, Will organized a selection of the photos into a presentation and had the negatives made into glass slides for use in a lantern projector. The slides were stored in a box along with a list by subject heading and the number of individual slides/images associated with that grouping (See list above). From this list we were able to, in many cases, group the remaining slides roughly into categories including First India, Second India, First Mesopotamia, Second Mesopotamia. In some cases, historic architecture was prominent and we can say exactly where the photo was taken. For example the photo below of the “Ancient Bridge” at Khanakin. Similarly notable geography led us to the location. Knowing that this photo was taken on the second trip to India we know that it was taken around Pachmari. The area is notable for its waterfalls. With that bit of sleuthing and the internet we were able to conclude that the picture below is of Bee waterfall at Pachmari and it is now within the Pachmari Biosphere Reserve. Other photos remain largely unidentified or the people in them are identified only to a certain level, e.g British Officer or Indian man. Photos such as the particularly interesting two men, the woman and the dog present only questions – who are they, why take their picture, where was the pictuer taken and so on. The men wear British Officers’ field uniforms, yet the man on the left is wearing what appears to be a Russian or French medal. Not entirely incongruous but who are they? As a result you will find that the interpretation of the collection is incomplete. Nevertheless we have included all of the photographs in the archive placing each within one of the geographical groupings: First Mesoptamia, Second Mesopotamia and so on. If you have any information or would like to offer suggestions regarding persons or places in the photos please leave a comment or contact John Snell at the email address provided on the contact page.